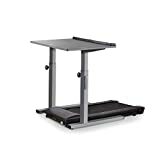 The NordicTrack Desk Treadmill is our pick for the best treadmill desk, with a nice LCD screen for the console and easy controls to choose from. The cushioned deck ensures comfort while walking or running and its drive system makes it powerful and steady. Our step-up pick is the LifeSpan TR1200-DT5 and it has an easy to read console for your statuses and the like. Measuring 38 x 29 for the surface area of the table, it can be synced with your mobile phone for activity tracking. It has an easy cable management system as well. The budget pick is the TrekDesk Treadmill Desk and it has a good workspace size of 34 x 2 inches. Including 2 cup holders for your drinks, it can take up to 55 lbs of any computer or equipment so you can work while you exercise. It has a file organizer and other features as well. A treadmill desk is a kind of treadmill that is used for offices so that employees can be fit while working. It is a mechanism that helps the person run in place while doing their desk work. It is a helpful exercise tool that you can situate in an office or in any workplace for added convenience. The benefit of the treadmill desk is that it can help you work while you exercise. It is great for those who want to exercise while they are doing their table jobs. This can help them do more than just your average work because of multitasking. Running, jogging and walking, in general, are all healthy habits that anyone should be able to do at least once or twice in a week to stay fit, especially running and jogging. While those with office jobs don't always get to move around physically, they can do so if they have special treadmill workstations to help them out. This kind of desk is great for those who do not have time to go to the gym. Going to the gym can be exhausting and time consuming. In general, not all of those who work in the office or have a home job could go to the gym whenever they like when they are busy. This is why this kind of innovation has been devised to help office workers not to sit all day. 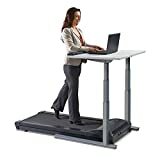 While standing desks can be okay, those with a treadmill become more active during the day and will help you stay fit even if you have an office job. Unlike a regular treadmill, they have a taller handle that has the same level as a standing desk. The design of this exercise equipment is different from the one that you see in the gym with a slightly thinner design and a slimmer profile that can help you fit it in the office space. They are less bulky in design and function much like regular running devices and exercise equipment. One of the key benefits of jogging or walking in a treadmill is the fact that you lose weight in a matter of time. If you want to get in shape and get a flatter tummy but you do not have the time to go to the gym or do some workouts then this kind of exercise equipment is perfect for you. It is a great investment to make in your office if you are a person who likes to multitask and want to squeeze in their workout routine. Size or dimensions: you have to know this if it fits your office and if the level is just right. The size of the machine is important so that you will know if it will be okay for your workspace and if you will feel comfortable. Adjustability: consider an easy to adjust machine so that it will not be uncomfortable for you during work hours. Exercise machines that are situated in the office or work area should be made easy to operate and can be adjusted on the height as well. Durability: you should have a machine that has enough durability so that it will not easily topple down. A stable and reliable exercise machine is important so that it will not wear out easily when you use it. Number of speeds: consider an exercise machine that has many speeds available, so that it will be easy adapt to for any skill level. Those who are beginners should stick to a speed that is not too fast, so that it will be appropriate to your fitness level. Ease of operation: you should pick an exercise running machine that should be easy to set on its speeds and to set it up on your office. It should be simple on its controls and user friendly for those who are busy when multitasking between their work and their exercise routine. As our top pick, the NordicTrack Desk Treadmill has a work surface of 40 x 18 inches and uses a drive system at 2.6 chp. It has a weight capacity of up to 300 lbs so it can accommodate most users. It is compatible with the iFit smart system and can reach up to 6 mph of speed for the belt. It has an easy to view LCD screen for your settings, a charging station (USB) plus an HR monitor. The only small concern with the NordicTrack Desk Treadmill is that like all treadmill tables, it can take some time and effort to assemble. The LifeSpan TR1200-DT5 is our step-up pick, which measures 29 x 38 inches in its total work surface area. It uses the Intelli-Step technology for step counting and it can also display other statistics such as the amount of calories burned, total time, distance and the like. It has a cable management system and it can be synced to your phone for your activity stats. 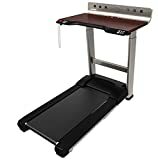 The TrekDesk Treadmill Desk is a great budget pick to consider which can support up to 55 lbs of computers or equipment. Its work table measures 72 x 34 inches and it is a great addition to any office space. There are 2 cup holders, a file organizer, a telephone stand, a manuscript holder and many other cool things to consider. The ThermoDesk ELITE is a great table to consider if you want one that has a cherry finish with many variants of the material. It has a top workstation size of 48 x 30 inches and the table height is adjustable as well. The digital display helps you monitor your current workout and it works quietly at only 46 dB of noise levels, suitable for office use. It can support users up to 265 lbs and the width is also adjustable. The Exerpeutic 2000 WorkFit is intended for heavy users as it can take up to 400 lbs of weight due to the frame being highly durable. The workstation size is 24 x 48 inches and it has a 4-foot distance from the table to the belt. The incline can be adjusted up to 15% and it is two times longer than regular units when it comes down to its handles for safety purposes. For a compactly designed workstation, the LifeSpan TR800 is a great choice with only 29 x 38 inches of work area. It can sync with your phone, count the important stats, has a cable management system and has an easy to read console for tweaking your settings as well. If you want a heart rate motor then the NordicTrack Desk Platinum is great for you. It has a USB dock and a top speed of up to 8 mph. It uses a 3.0 chp drive system and comes with a work area of 40 x 18 inches. It can also be set up to 10% on its incline option. Different from our top pick, the LifeSpan TR1200-DT7 is capable of syncing with your phone, has an area of 29 x 38 inches for the table and has a cable management system. It also displays the important statistics on its console. The Life Fitness Treadmill is great for those who want a USB dock in their workstation. It has a speed of up to 2 mph, has an LCD console display, 3 AC power outlets, a max weight capacity of 350 lbs and an Ethernet port for computers. The Dr. McBabe's Treadmill has a rubber surface that makes it easier to keep items steady and not slipping away. It can be portable for most office spaces and is made with durable material. The design makes the unit less noisier than others. Others did not get included in this list because they lacked in settings and were also not very easy to setup. They were also too bulky and complicated to put in an office. It is important to have a durable and easy to configure unit for you to run on or walk on. Q: What are the benefits of running on a treadmill? You can gain leg strength. This is important for athletes or just for people who normally get really tired when they walk or stand all day. Endurance begins with a lot of practice and exercise and getting the right leg strength can help you not feel tired all the time when you stand or walk for long hours. It is good for your cardiovascular health. Having a healthy heart and good cardiovascular health is highly important so that you can increase your life expectancy and it will also reduce the likelihood of heart problems in the future. It will also help you get more endurance when you perform physical activities so it pays to try something like the running machine. You can lose fat and calories faster with it. If you want a simple and straightforward way of slimming down, the running machine can be a great way to do it. The workout that you want to do can depend on what you set on the console of the machine, which makes having a custom program super easy. It helps you to reduce fat to gain more confidence in yourself and to be healthier. It is easy to use for most people. Anyone who has the proper mindset can easily operate the running machine due to its simplicity. The controls for the machine can be super simple due to the easy buttons. You can set the speed and the level of intensity of your workout and you can also set an incline mode to make the overall exercise activity more challenging in the long run. You reduce the risk of tripping because you are aware of the surface. Because you can control the incline, the speed and many other factors while you are running on the machine, you can be assured that you won’t trip if you maintain a proper posture and running pace on it. This beats having to go into terrain outdoors and land your knees on sharp rocks. However, there are running machines with programs for pros that give random incline programs. You may be able to track your progress if you integrate it with your fitness watch. Most modern running machines can be great for those moments that you want to track the number of steps that you have done using your fitness watch or band. It can be a great motivating tool for those who want to keep a fit lifestyle every single day. You can do it even in the rainy days. The exercise machines have a big advantage over outdoor gear in this case because some people just can’t get out of their homes due to bad weather, so they have no chance or opportunity of exercising and staying fit. If the weather is super cold outdoors, you can depend upon an exercise machine such as a running machine to help you stay fit in the midst of cold and rainy afternoons. It is great for your overall lower body workout. If you have been looking for a kind of workout that emphasizes on your legs and other parts of your lower body, running on the machine can be a great way to do it. For those needing some leg and feet power or basically any lower body exercise, any casual walking and running exercise will do the trick. Running on it can help you with your balancing skills. Because you need to keep a steady pace and balance yourself properly while you run or walk on the machine, it helps to improve your overall sense of balance. This is important when you often feel out of balanced and need to get a better grip on your mobility issues as well. You can challenge yourself with different speeds and angles. The different settings that you can find on a running machine can make it more challenging than your average running or walking spree. The incline option can help out with your endurance and heart rate and the speed can practice you for really fast runs or walks. The adjustability of the speeds and angles of incline can make things interesting while you work out. It reverses the damage done by sitting all day. The running machine is great for people who have been sitting a lot during their office hours or school hours. If you find yourself always sitting at home and have a bad posture, you can help remedy this by running on the machine for as much as you can, gradually increasing your level of speed. You can multitask better with this kind of machine, as some permit reading using media holders. Q: Why should office workers have a standing desk? Sitting all day can be unhealthy for your body and well-being. It helps them focus more on their work. It can help lower your blood sugar levels and reduce the risk of diabetes. It helps them stay fit while working. It ensures a good posture, which is good for their bones. It makes your heart stronger against diseases. You also get benefits for your back. It can help reduce anxiety and improve your work mood. You can be much more productive when you stand up while working. The life expectancy of people who stand more than they sit can be greater. Q: What are the parts of a running machine? The belt is the most important part of the machine, in which the deck lies on. It is like a factory conveyer belt but is flat and wide enough for a person to run or walk on. Those that are of high end can have a 2-ply construction to make them stronger and more durable. Most of them can run even quieter than lower priced and lower quality ones. The frame of the running machine is the very foundation of the whole thing, since it will be supporting the rest of the parts. It should be sturdy enough to last for a long time because you are basically paying mostly for the housing or the frame. It should come with properly riveted parts. The motor is what drives the running machine to its extent so that you can use it for longer periods of time. The unit should have a durable motor and it depends upon how much is its top speed and its power. There are many criteria to consider in selecting the right running machine motor. The roller is the part of the machine that moves the belt throughout the entire exercise. The belt should fit properly on the roller, and the roller itself should be durable and not cause a lot of noise. It is best to stick with rollers that are slightly higher in price. The display console is the part of the running machine that gives you all of the information that you need when you’re training. It gives you the current program, the settings you can choose and other specifics. The console may also have the ability to sync with your fitness device. The flywheel is the part of the machine that keeps the belt mechanism steady as much as possible. A good flywheel will be great for stability and is found mostly on higher priced machines. The purpose of the flywheel is to make the spin of the roller and belt constant and not too harsh. Q: How is a running machine for gyms different from ones that are in the office? Gym use units look pretty much regular, with a fairly sized height. Office use units have slightly higher heights, enough for working while you are standing. To get fit while at the gym, or while reading a book or watching your favorite series. To get fit while you are working on an office job. Gym use units can vary in difficulty, but can be easy enough for the lowest setting. Office use units are more challenging, because you have to combine clerical work with fitness. Q: Who can use a running machine? Adults who want to get fit will benefit from it. The running machine is mostly an adult thing because of the intensity of the workout given. If you’re somewhere in the 20s up to 40s, you can definitely benefit from using the running machine, since it’s a great source of workout even when it’s raining outside or when you don’t have a place to jog on due to the dangers of the outside world. Teens who want to get fit or in shape can use a running machine. Even teenagers at least 13 years old and above can benefit from the expertise of a running machine, provided that they only set it for the easiest and tolerable setting for running or casual walking. Inclines are only applicable for those with better strengths, such as athlete teens or those who normally get into various physical activities at school or during vacation. Q: How many hours a day should you get off your chair? A: Anyone who has an office work or table job needs at least 2 to 4 hours of standing in one day. Sitting all day can make a person prone to various illnesses and loss of flexibility and strength. To prevent sitting all day, most people can invest in exercise machines that can be situated in the office so they can work while they stay fit. Q: What are the benefits of exercise machines? They can be used even when it is raining or snowing outside. They can help provide you relief from stress, anxiety and other mood problems. They provide you with statistics that motivate you. They may burn a lot of calories from the food you eat. They can be used even at work, provided you have the right space for them (and they’re allowed). If you have one at home then you don't need to go to the gym - you can avoid hassle altogether. Q: How often should you use the running machine? Q: What settings can be found on a running machine? Incline option: the incline option helps simulate actually running uphill, which is important for adding challenge to your running spree. Speed settings: these settings are important so that you know when to set it lower for easier running, and when to set it to higher for a more challenging speed. Music player compatibility: most running machines are highly compatible with music players, making them less boring when you run on them for long hours. Custom routes: some modern and computerized running machines also have custom routes, which mimic the terrain of famous trails that are pre-programmed in the unit, with the use of the incline option that simulates actually running on the said trail. Some of these custom routes can also download stuff from Google maps to add realism to the running activity. Q: What happens if you sit all day? To reduce these threats to your overall health and wellness, consider getting at least 30 minutes of any physical activity and it helps to stand once in awhile. Q: How many steps a day is recommended for a person to stay healthy? A: To stay healthy, you need at least 5,000 steps a day. While it is true that most fitness crazes are telling you to get at least 10,000 steps a day to become fit, fabulous and lean with a health body, it should not be your ideal goal if it is not in your natural lifestyle. If getting 10,000 steps a day on your fitness watch is distracting your day job or school work, it may not be worth doing. Remember that the number of steps depends on your lifestyle, but going more than 5,000 a day is the best for the average person with a regular lifestyle. You don’t need to go for 10,000 steps as a primary goal – stick to something more realistic like 7,000 to 7,500 steps a day. Q: How do I ensure that I operate the running machine safely? Never let children use the running machine without adult supervision. Babies and youngsters should be kept away from these machines. Consider getting all of the stuff you need in front of you, to keep you focused. Make use of the rails when you get on and off the machine. Unplug the running machine when you are not using it. Always read the user’s manual to ensure you set it up and use it properly. Only one person at a time should go on the running machine. Talk to your children about the potential dangers of the running machine when not used properly. Q: What is the ideal speed for the running machine? Children in this age bracket should be closely supervised by parents. They should get at least 30 minutes of physical activity, at about 1.5 to 3 miles per day, depending on how much they can walk on the running machine. This depends on your skill level, as some are athletes and are professionally trained for higher speeds and conditions. Seniors should take extra care when they run on the running machine to avoid bone fractures and the like from happening. Q: How much calories can you burn on a running machine? Q: What possible mistakes could I make when I’m using the running machine? 1. Do you ever change your running routine? - Having a monotonous workout can be tiring as well, so it pays to have a little change sometimes. You can add some challenge to your running spree by increasing the speed or using the incline option. Most modern running machines have unique features such as custom routes or random inclines so you can feel some excitement in your workout. It also pays to have some small competition with others, but mostly to improve yourself. 2. Do you land with your foot flat or with your mid foot? - Landing on your midfoot gives you a better advantage with speed and stamina. Using a flat foot landing can actually be dangerous because it tends to pull the muscles on the back of your feet in a way that hurts a lot later on. Mid foot landings also help better in balancing. 3. Do you wear proper shoes for running on the machine? - Using the appropriate shoes that are comfortable and are not slippery can help you run faster, longer and better on the running machine. Consider breathable materials for your shoes and ensure that they fit properly so that they don’t feel awkward when you use them for your running machine. 4. Do you look down on your feet while running? - Looking down on your feet can actually make you feel dizzy, especially if you’re born with some genetic form of dizziness, vertigo or lightheadedness. Just look straight ahead and run normally – most of these running machines will be wide enough for you to jog, walk or run on anyway. 5. Do you swing your arms too often while running? - While this can add more workout intensity if you also want to do your upper body, it is not recommended to swing your arms too much when running because it can make you feel tired faster. It is okay if you really feel like falling because of a high speed or losing balance, and you don’t want the help of the rails, but the goal is to try to minimize it if your goal is a lengthy session. 6. Do you depend on the bars too much? - Let’s face it: bars can be a tempting thing to depend on. If you’ve seen those dance machines that have rails on them, these bars or rails can be great if you really need to go for a faster workout (or song/dance in that case), but you should not depend on them too much if you can manage the speed of your workout and not lose balance. 7. Do you run with an upright position or hunching forward? - An upright position is certainly better because you can balance yourself even better, although it can be difficult at first. Hunching forward isn’t good for your posture, so you need to practice running and walking upright so that you don’t get a bad back later on. 8. Do you take frequent breaks or exhaust yourself? - As with all physical activities, it’s okay to love yourself once in awhile. Don’t stress too much if you can’t reach your goal – ensure you get enough breaks and hydration after you run on a single session. Don’t feel intimidated by other people just because they can do better on the running machine. Just run or walk at your own pace and challenge yourself little by little to your own capacity. 9. Do you try to improve all aspects of your workout overnight? - Always remember that like all physical activities, nothing can be done overnight. If you want to focus on speed, don’t try to squeeze in endurance in your current workout plan. These things take time – improve the aspects of your running or walking session one by one so you don’t confuse yourself or exhaust yourself too much. Q: What things am I doing wrong with a standing table in the office? Don’t simply stand – do something else! This is why most people invest in a running machine standing table rather than just standing on their work table. Simply standing is very much like simply sitting – you need to move in order to actually burn calories and get into shape. Don’t spend too much time standing. Just because sitting has a bad reputation doesn’t mean you don’t have the right to sit down once in awhile. Standing up too much can make some people dizzy and lose the proper blood flow, which can put them at risk for various heart problems and loss of balance. Don’t stand too much if your office or home-based work requires a lot of clerical attention. Some work, such as writing a report, analyzing data, computing sales, writing articles, programming and the like, can require a lot of brainpower, in which standing might make you exhausted enough to lose brain power as well. Consider resting once in awhile if your job involves a lot of critical thinking. Don’t stand at work if it gets you tired a lot. There are some office jobs that require you to get from point A to point B to deliver papers and get signatures from people. There are also certain jobs in the assembly line in which you are already probably working on something – just not standing. Consider your job nature first and your stamina before you get a standing table. Don’t try to buy a standing table if you think it’s too pricey. Not many people can afford standing tables for their work, and not all companies or firms allow them either. It may be best to stick with a conventional table and then exercise during breaks instead. 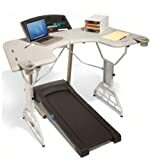 Q: What should I adjust in the office when I want to add a running machine table? Q: How much hours a day should I use the table running machine? A: You can run on this machine for about 2-3 hours a day, but with intervals of 1/2 hour so that you won’t feel tired afterwards. It pays to have the right amount of rests in between going on and off the running machine. Q: What is the ideal speed of a running table machine? A: When you run on this machine, consider starting with 1 mph and then gradually increase it if you’re not doing something clerical. Don’t go for higher speeds if you’re busy with a report or if you are getting tired physically and mentally at the same time. Q: Can standing tables help reduce blood sugar levels? How much? A: That depends on your lifestyle and a number of factors. A study found an 11% decrease for blood sugar levels for their participants, and it also helped to increase the good cholesterol in the body, which is crucial for good overall health. 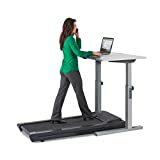 The NordicTrack Desk Treadmill is our pick for the best treadmill desk due to its easy to use console, cushioned deck design and good drive system that keeps the runner stable.